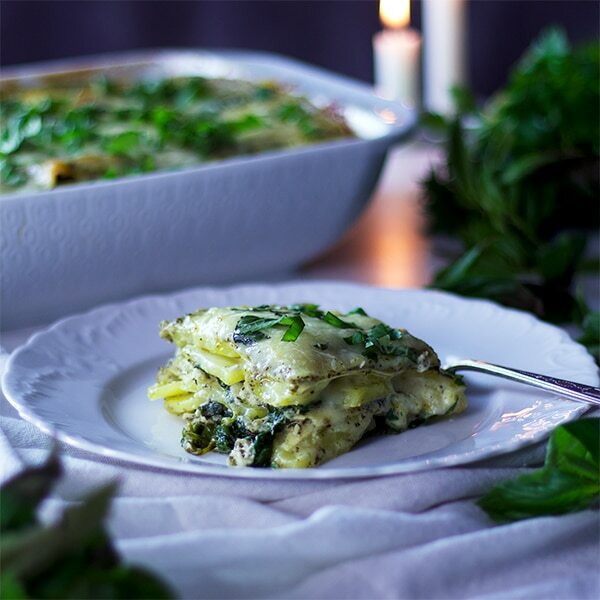 Layer after delicious layer of cheesy Green Tea Pesto Béchamel Sauce, thin, tender potatoes, ricotta cheese, spinach sautéed with garlic and red pepper and tons of mozzarella and parmesan cheese. 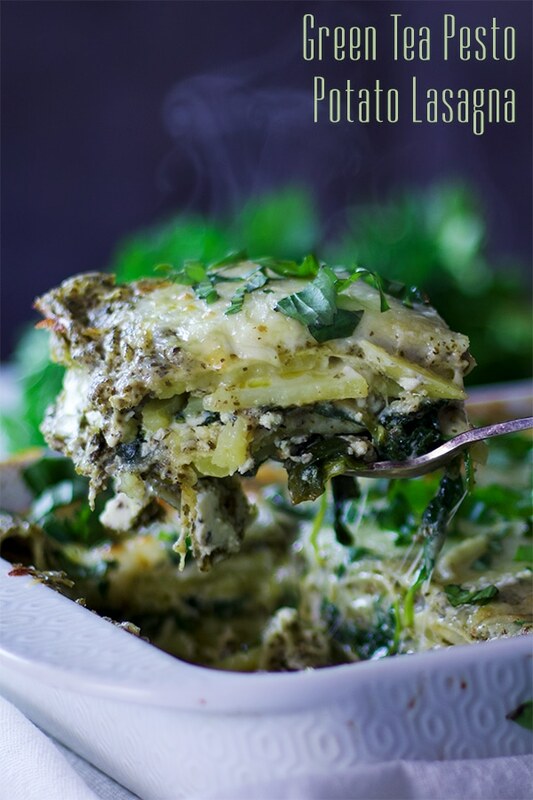 This Green Tea Pesto Potato Lasagna is a fresh, creamy, decadent and delicious. One of my requirements when I’m hosting a dinner party is that the majority of the food can either be prepared in advance and easily reheated, or that it requires a long bake time. Soups and stews that have to simmer for at least an hour. 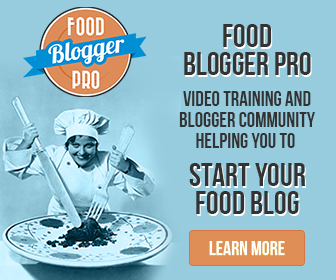 Slow cooker dishes. 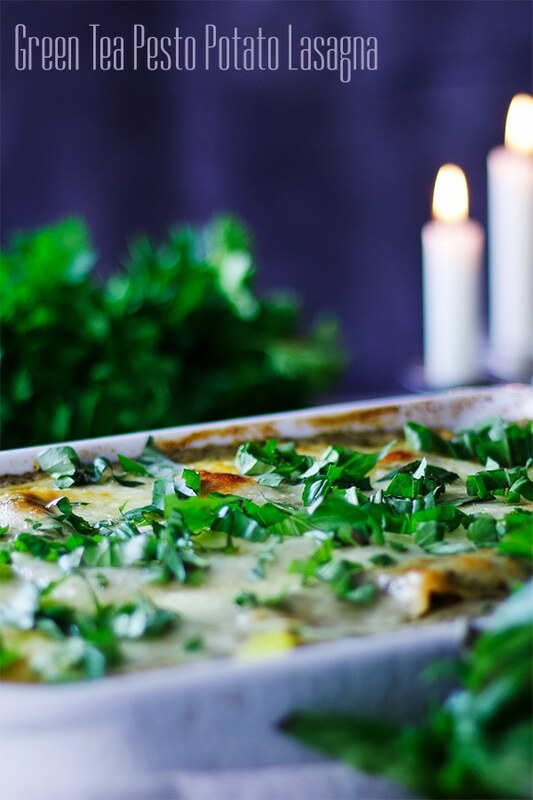 And casseroles – like lasagna. I am the worst multi-tasker on the face of the earth. Years ago, while working as a cake decorator, I was decorating a birthday cake while chatting with a co-worker. When the cake was finished, I looked down to discover that instead of writing “Happy Birthday”, I had written “Happy Blackwell” (my last name). I covertly removed the offending letters and prepared to start again, while still chatting. I looked down at my work to see that I had written “Happy Blackwell” AGAIN. Embarrassed, I once again covertly removed the writing only to make the mistake once more. For the third time. At this point, embarassment dissolved into laughter as I explained to my coworker what I had just done, THREE FLIPPIN’ TIMES, and asked her to kindly stop talking to me for two minutes so I could actually write a happy birthday message on the poor customer’s birthday cake. So. Talking with guests while preparing food is not my forte, as the afore mentioned story illustrates. And this, my friend, is why dishes like lasagna are absolute perfect when I’m entertaining a group. I can get everything prepare before the guests arrive, set a timer, and put it in the oven. As guests arrive, the lasagna cooks away unattended and I can concentrate on my guests and only on my guests, which is really good for everyone. Green tea and pesto are a match made in heaven. Honestly, I don’t know why green tea isn’t a standard ingredient in pesto. It should be. First of all, adding green tea to pesto takes an already healthy food and makes it even better for you. Second, green tea adds a complex quality to pesto that’s difficult to describe. 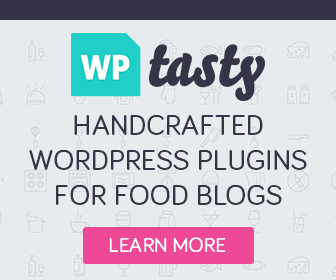 It doesn’t give the pesto an overt tea flavor. Rather, it seems to elevate all the other flavors so that they are brighter and more pronounced. In this recipe, loose green tea is added to prepared pesto then blended briefly in the food processor. I used prepared pesto because I live in Colorado and it’s barely April and good fresh basil is hard to come by this time of year. A few weeks from now will be a different story, but for now, prepared pesto is the way to go. Start by seeping a few green tea bags in warm milk, which will be transformed into a silky smooth, cheesy, green tea pesto béchamel sauce. SO. GOOD. Peel a few potatoes and slice them very, very thin. This is easiest to do with a mandolin. I own an OXO Mandolin Slicer that cost about $15 on Amazon. Totally worth it for things like this. Cook the potatoes in salted boiling water until tender then sauté some spinach in oil with garlic and red pepper flakes. Use that gorgeous tea flavored milk to make a simple béchamel sauce, stirring in copious amounts of parmesan cheese and green tea pesto. Then, build your lasagna, layer by delicious layer. 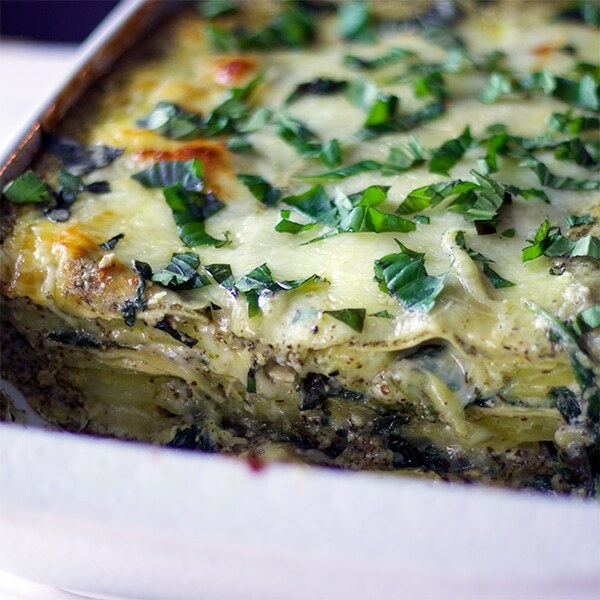 Layer after delicious layer of cheesy Green Tea Pesto Béchamel Sauce, thin, tender potatoes, ricotta cheese, spinach sautéed with garlic and red pepper and tons of mozzarella and parmesan cheese. 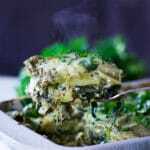 This Green Tea Pesto Lasagna is a fresh, creamy, decadent and delicious. Pour the milk into a saucepan and set it over medium-high heat. Cook until small bubbles appear around the edges of the pan – just before it boils. Remove from the heat and add 4 bags of green tea, dunking the bags in the milk to soak. Let stand. Add the prepared pesto to the bowl of a food processor fitted with the chopping blade. Cut open the 10 remaining bags of tea and dump the loose tea into the pesto. Process for about 20 seconds to blend. Fill a large saucepan with water, sprinkle in about 1 tablespoon of salt, and set it over high heat. Peel the potatoes and slice them into very thin slices – about 1/4 to 1/8-inch thick. (This is easiest to do with a mandolin.) When the water begins to boil, drop in the potato slices. Let cook for 6-7 minutes, until tender. Drain the potatoes in a colander set in the sink. Add the oil to the saucepan you just cooked the potatoes in and set it back over medium heat. When the oil is shimmering, add 1/2 tsp of the crushed red pepper and the garlic, stirring them around in the oil for about 10 seconds. Add the spinach. Stir it around briefly, then leave it alone for 1-2 minutes, to allow the bottom leaves to wilt. Cook stirring constantly, for 2 minutes longer, until all the leaves are completely wilted. Remove from the heat and sprinkle with about 1/2 tsp of salt. Lift the tea bags from the milk and squeeze out some of the milk they’ve soaked up. Discard tea bags. Add the butter to a medium sized heavy bottom saucepan and set it over medium heat. When the butter has melted, add the flour, remaining 2 tsp crushed red pepper, 1 & 1/2 tsp salt, and 1 tsp ground black pepper. Cook, stirring constantly, for 30 seconds. Remove the pan from the heat and add the milk very slowly, bit by bit, whisking constantly. When all the milk has been added, return the pan to medium heat. Cook, stirring constantly, until the milk begins to boil. Cook and stir 2 minutes longer. Remove from the heat and stir in the green tea pesto and 1 & 3/4 cups of the parmesan cheese. Stir until the cheese is melted. Add the ricotta, Italian seasoning, eggs, and 1 tsp of salt to a bowl and stir to combine. Spread about 1/4 cup of green tea pesto sauce over the bottom of a 9×13 rectangle baking dish. 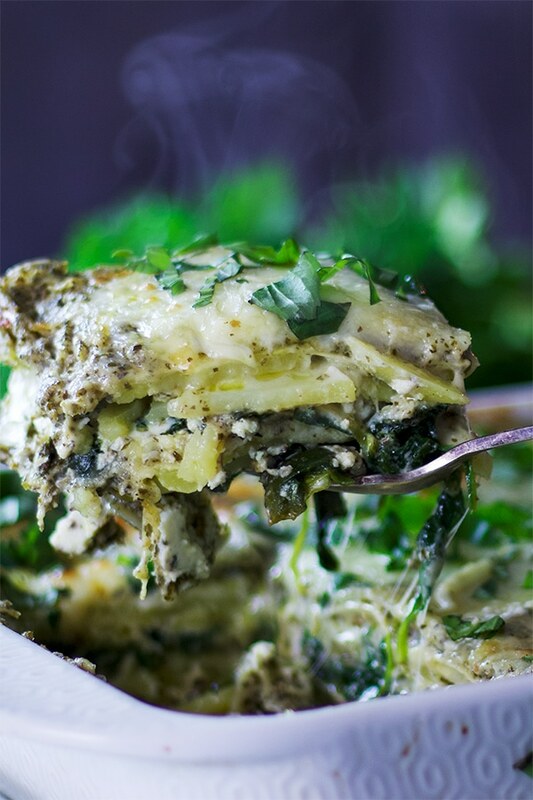 Lay 4 lasagna noodles over the pesto sauce. Spoon about one third of the remaining pesto sauce over the pasta, spreading it out into an even layer. Dollop half of the ricotta mixture over the pesto sauce, and spread it out into an even layer. 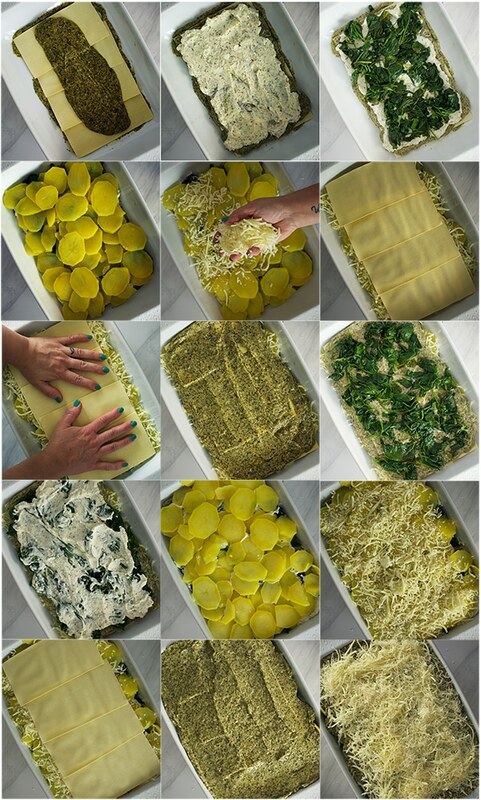 Top with half of the spinach, then half of the potatoes, spreading each into an even layer. Sprinkle with one third of the mozzarella cheese. Add another layer of 4 sheets of lasagna noodles. Use both hands to press down on the noodles, compacting the layers beneath them. Spread the pasta with another third of the pesto sauce, and top with the rest of the spinach. Dollop the rest of the ricotta over the spinach and spread it out into an even layer. Top with the remaining potatoes and another third of the mozzarella cheese. Add another 4 sheets of lasagna noodles. Once again, use both hands to press down on the noodles, compacting the layers beneath them. Spread the rest of the pesto sauce over the noodles, top with the rest of the mozzarella cheese and the remaining 1/4 cup parmesan cheese. Set the lasagna on a baking sheet (just in case there are any drips). Spray a sheet of aluminum foil with non-stick baking spray and loosely cover the lasagna. Bake for 45 minutes. Remove the foil and bake for another 15 minutes, until the cheese on top is melted and beginning to brown, and the pesto sauce is bubbling up around the edges of the baking dish. Remove from the oven and let rest for 15 minutes before slicing and serving.